Throughout the last decade, the bathroom has started to become a modern retreat where more time is spent and more remodeling effort is invested in the home. The modern bathroom allows the user to bathe, shower and even wash their hands in a luxury that wasn’t even envisioned a decade ago but is now available to any home owner that wants to invest in it. We have collected some of the greatest innovations available today in this post for you to drool over, or invest in, when completing your next remodel. While once reserved for only kitchen faucets, the Green Tea faucet from American Standard combines the beauty of a bathroom faucet with the functionality of a pull out spout. The pull out spout allows you to complete tasks such as washing a pet or even your feet with ease. These faucets are easy to install and the one of the most affordable items on the list. IO Digital shower system from Moen allows the user to create a unique and innovative experience with either their shower or tub. The IO Digital can maintain temperature and flow rate with precise digital controls and even has presets so it can remember the flow and temperature everyone in the house likes. It also allows you to turn on the shower and your preset with the touch of a button. All of this leads to a showering experience that is truly innovative. The Kohler Sok bathtub creates the perfect bathing experience. The bathtub allows the user to fill the water all the way up to the rim, removing the overflow that stops the bathtub from filling completely. The Kohler Sok tub simply spills over the edge and is drained normally when the user enters, making a carefree bathing experience that allows the entire body to be completely encased in water. The tub also has whirlpool options that add increased comfort. In a place where you thought innovation had run its course, the bathroom mirror has been upgraded to fit the modern bathroom. The Robern bathroom mirror has an integrated TV that allows the user to never miss a second of their favorite game or TV show, even when prepping in the bathroom. It also has an integrated MP3 jack that allows the user to plug in an MP3 player and play their favorite music right from the mirror. While not as innovative as other items on this list, many people are unaware of the fact that you can buy and install a towel warmer in your bathroom easily over the course of a weekend. These towel warmers come in many styles and finishes and can be directly plugged into an outlet in order to keep your towel perfectly warm no matter what the temperature is outside. For colder climates this is a must have. 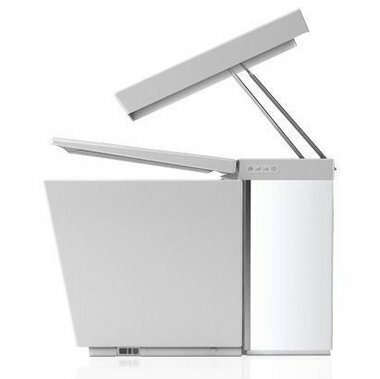 Last but not least, the Kohler Numi is the ultimate toilet. Complete with every innovation available to the modern bathroom user, the toilet has integrated bidet functionality, MP3 input and radio tuner, soothing lighted bowl options and a toilet seat that opens when you walk in the room. This toilet truly does it all and more. It is the pinnacle of modern bathroom innovation at a price tag that will have only most elite bathrooms installing it. The toilet alone retails for around 6000 dollars. These are just a few of the modern innovations available to anyone looking to upgrade or remodel their bathroom. I expect to see even more jumps in bathroom technology in the next few years and would love to hear your comments if there is something that you have seen that I left out. Josh works for Plumber Surplus which sells many of the products above as well as faucets for your bathroom. How to Renovate on a Budget What Makes a Modern Kitchen?